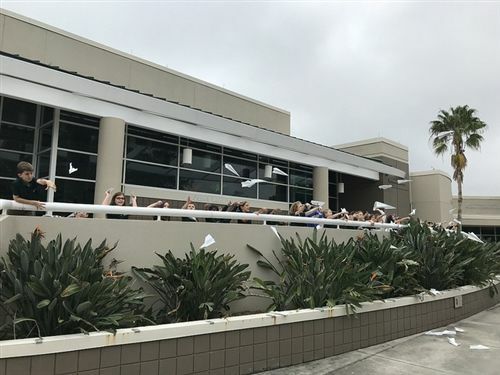 As part of Shorecrest's 100th Day of School celebration, Mrs. Johnson's and Ms. Tucker's second grade classes met to make and launch 100 paper airplanes. Students worked in pairs to contribute to a class pool of 100 planes total. With the two classes, that worked out to about 3 paper airplanes per student. They then took them to the Janet Root Theatre to launch them off the "balcony" area. Find photos and a video clip here.